Comrades, I would like to make a few remarks concerning the speeches of Comrades Tanner and McLaine. Tanner says that he stands for the dictatorship of the proletariat, but he does not see the dictatorship of the proletariat quite in the way we do. He says that by the dictatorship of the proletariat we actually mean the dictatorship of the organised and class-conscious minority of the proletariat. True enough, in the era of capitalism, when the masses of the workers are subjected to constant exploitation and cannot develop their human capacities, the most characteristic feature of working-class political parties is that they can involve only a minority of their class. A political party can comprise only a minority of a class, in the same way as the really class-conscious workers in any capitalist society constitute only a minority of all workers. We are therefore obliged to recognise that it is only this class-conscious minority that can direct and lead the broad masses of the workers. And if Comrade Tanner says that he is opposed to parties, but at the same time is in favour of a minority that represents the best organised and most revolutionary workers showing the way to the entire proletariat, then I say that there is really no difference between us. What is this organised minority? If this minority is really class-conscious, if it is able to lead the masses, if it is able to reply to every question that appears on the order of the day, then it is a party in reality. But if comrades like Tanner, to whom we pay special heed as representatives of a mass movement—which cannot, without a certain exaggeration, be said of the representatives of the British Socialist Party—if these comrades are in favour of there being a minority that will fight resolutely for the dictatorship of the proletariat and will educate the masses of the workers along these lines, then this minority is in reality nothing but a party. Comrade Tanner says that this minority should organise and lead the entire mass of workers. If Comrade Tanner and the other comrades of the Shop Stewards’ group and the Industrial Workers of the World accept this—and we see from the daily talks we have had with them that they do accept it—if they approve the idea that the class-conscious Communist minority of the working class leads the proletariat, then they must also agree that this is exactly the meaning of all our resolutions. In that case the only difference between us lies in their avoidance of the word “party” because there exists among the British comrades a certain mistrust of political parties. They can conceive of political parties only in the image of the parties of Gompers and Henderson, parties of parliamentary smart dealers and traitors to the working class. But if, by parliamentarianism, they mean what exists in Britain and America today, then we too are opposed to such parliamentarianism and to such political parties. What we want is new and different parties. We want parties that will be in constant and real contact with the masses and will be able to lead those masses. I now come to the third question I want to touch upon in connection with Comrade McLaine ’s speech. He is in favour of the British Communist Party affiliating to the Labour Party. I have already expressed my opinion on this score in my theses on affiliation to the Third International. In my pamphlet I left the question open. However, after discussing the matter with a number of comrades, I have come to the conclusion that the decision to remain within the Labour Party is the only correct tactic. But here is Comrade Tanner, who declares, “Don’t be too dogmatic.” I consider his remark quite out of place here. Comrade Ramsay says: “Please let us British Communists decide this question for ourselves.” What would the International be like if every little group were to come along and say: “Some of us are in favour of this thing and some are against; leave it to us to decide the matter for ourselves"? What then would be the use of having an International, a congress, and all this discussion? Comrade McLaine spoke only of the role of a political party. But the same applies to the trade unions and to parliamentarianism. It is quite true that a larger section of the finest revolutionaries are against affiliation to the Labour Party because they are opposed to parliamentarianism as a means of struggle. Perhaps it would be best to refer this question to a commission, where it should be discussed and studied, and then decided at this very Congress of the Communist International. We cannot agree that it concerns only the British Communists. We must say, in general, which are the correct tactics. I will now deal with some of Comrade McLaine’s arguments concerning the question of the British Labour Party. We must say frankly that the Party of Communists can join the Labour Party only on condition that it preserves full freedom of criticism and is able to conduct its own policy. This is of supreme importance. When, in this connection Comrade Serrati speaks of class collaboration, I affirm that this will not be class collaboration. When the Italian comrades tolerate, in their party, opportunists like Turati and Co., i.e., bourgeois elements, that is indeed class collaboration. In this instance, however, with regard to the British Labour Party, it is simply a matter of collaboration between the advanced minority of the British workers and their vast majority. Members of the Labour Party are all members of trade unions. It has a very unusual structure, to be found in no other country. It is an organisation that embraces four million workers out of the six or seven million organised in trade unions. They are not asked to state what their political opinions are. Let Comrade Serrati prove to me that anyone there will prevent us from exercising our right of criticism. Only by proving that, will you prove Comrade McLaine wrong. The British Socialist Party can quite freely call Henderson a traitor and yet remain in the Labour Party. Here we have collaboration between the vanguard of the working class and the rearguard, the backward workers. This collaboration is so important to the entire movement that we categorically insist on the British Communists serving as a link between the Party, that is, the minority of the working class, and the rest of the workers. If the minority is unable to lead the masses and establish close links with them, then it is not a party, and is worthless in general, even if it calls itself a party or the National Shop Stewards’ Committee—as far as I know, the Shop Stewards’ Committees in Britain have a National Committee, a central body, and that is a step towards a party. Consequently, until it is refuted that the British Labour Party consists of proletarians, this is co-operation between the vanguard of the working class and the backward workers; if this co-operation is not carried on systematically, the Communist Party will be worthless and there can be no question of the dictatorship of the proletariat at all. If our Italian comrades cannot produce more convincing arguments, we shall have to definitely settle the question later here, on the basis of what we know—and we shall come to the conclusion that affiliation is the correct tactic. Comrades Tanner and Ramsay tell us that the majority of British Communists will not accept affiliation. But must we always agree with the majority? Not at all. If they have not yet understood which are the correct tactics, then perhaps it would be better to wait. Even the parallel existence for a time of two parties would be better than refusing to reply to the question as to which tactics are correct. 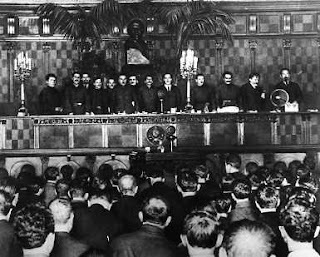 Of course, acting on the experience of all Congress delegates and on the arguments that have been brought forward here, you will not insist on passing a resolution here and now, calling for the immediate formation of a single Communist Party in each country. That is impossible. But we can frankly express our opinion, and give directives. We must study in a special commission the question raised by the British delegation and then we shall say: affiliation to the Labour Party is the correct tactic. If the majority is against it, we must organise a separate minority. That will be of educational value. If the masses of the British workers still believe in the old tactics, we shall verify our conclusions at the next congress. We cannot, however, say that this question concerns Britain alone—that would mean copying the worst habits of the Second International. We must express our opinion frankly. If the British Communists do not reach agreement, and if a mass party is not formed, a split is inevitable one way or another.